This is another emotional letter to Brown, written just after the Maria Cowther was released from quarantine in Naples. 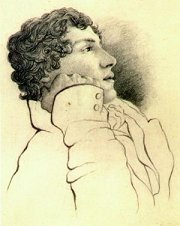 Keats writes, ‘If I had any chance of recovery, this passion would kill me.’ His obvious physical and emotional turmoil worried his companion, Joseph Severn, who also wrote letters to their friends in England. Naples. Wednesday first in November. Yesterday we were let out of Quarantine, during which my health suffered more from bad air and a stifled cabin than it had done the whole voyage. The fresh air revived me a little, and I hope I am well enough this morning to write to you a short calm letter; – if that can be called one, in which I am afraid to speak of what I would the fainest dwell upon. As I have gone thus far into it, I must go on a little; – perhaps it may relieve the load of WRETCHEDNESS which presses upon me. The persuasion that I shall see her no more will kill me. I cannot q—- My dear Brown, I should have had her when I was in health, and I should have remained well. I can bear to die – I cannot bear to leave her. Oh, God I God! God I Every thing I have in my trunks that reminds me of her goes through me like a spear. The silk lining she put in my travelling cap scalds my head. My imagination is horribly vivid about her – I see her – I hear her. There is nothing in the world of sufficient interest to divert me from her a moment. This was the case when I was in England; I cannot recollect, without shuddering, the time that I was prisoner at Hunt’s, and used to keep my eyes fixed on Hampstead all day. Then there was a good hope of seeing her again – Now! – O that I could be buried near where she lives! I am afraid to write to her – to receive a letter from her – to see her hand writing would break my heart – even to hear of her any how, to see her name written would be more than I can bear. My dear Brown, what am I to do? Where can I look for consolation or ease? If I had any chance of recovery, this passion would kill me. Indeed through the whole of my illness, both at your house and at Kentish Town, this fever has never ceased wearing me out. When you write to me, which you will do immediately, write to Rome (poste restante) – if she is well and happy, put a mark thus + , – if – Remember me to all. I will endeavour to bear my miseries patiently. A person in my state of health should not have such miseries to bear. Write a short note to my sister, saying you have heard from me. Severn is very well. If I were in better health I should urge your coming to Rome. I fear there is no one can give me any comfort. Is there any news of George? O, that something fortunate had ever happened to me or my brothers! – then I might hope, – but despair is forced upon me as a habit. My dear Brown, for my sake, be her advocate for ever. I cannot say a word about Naples; I do not feel at all concerned in the thousand novelties around me. I am afraid to write to her. I should like her to know that I do not forget her. Oh, Brown, I have coals of fire in my breast.. It surprised me that the human heart is capable of containing and bearing so much misery. Was I born for this end? God bless her, and her mother, and my sister, and George, and his wife, and you, and all ! Notes: The Xs in the postscript represent William Haslam’s name. Charles Brown (or a later copyist) crossed out many of the names in Keats’s letters.